Today is opening day for the Kansas City Royals. They will square off around 3pm against the LA Angels of Anaheim (when did they change their name?). 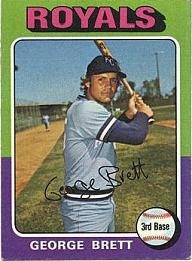 Once upon a time baseball in this city used to be fun - George Brett was a rookie, Frank White won golden gloves and the Royals regularly made the playoffs.. they even one it all in 1985. Sadly the beloved team owner passed away and the CEO of Walmart bought the team and ran it into the ground. But enough about that! Here's to opening day and dreams of playoff berths and world championships. Play Ball! Would love to go to opening day, but not this year. Need a job more than a ball game. I hope the Royals do well this year and that the Mariners do better! I think the Angels changed their names a couple of years ago. We're here for a Sandi Patty weekend at the Gaylord Opryland Hotel. We will watch the Dodgers and Giants on TV later today! Our friends just invited us to go with them to a Dodger game April 21st.